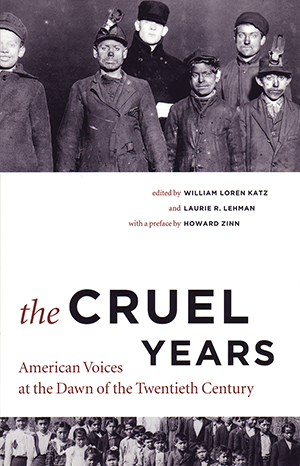 The Cruel Years provides readers with a vivid picture of what life was like a hundred years ago, not for the rich and famous but for ordinary working Americans. The story is told in the words of twenty-two fascinating people who lived by laboring long hours at farms and factories and mines. A preface by Howard Zinn and an introduction by William Loren Katz provide an easy-to-follow historical map that places these hard-hitting, first-person narratives in the context of their troubled times and within the larger picture of U.S. growth and development. Here are the no-nonsense words of a young immigrant trying to survive as a sweatshop operator in New York City, a hard working farmer’s wife who has writing ambitions; a black southern sharecropper seeking fulfillment under a new system of slavery; a young Puerto Rican passing the Statue of Liberty and ready for new challenges; a Chinese immigrant, a Mexican immigrant, and a Japanese immigrant struggling to rise from lower rungs on the social and economic ladder; an Irish girl of sixteen deciding to become a political agitator; a black southern woman trying to fend off the hurts of Jim Crow; a coal miner telling of the lethal dangers of his work; and a black cowhand rejoicing in the thrill of the cattle trails.